If, in connection with the operating room, a lift can be provided, large enough to take a patient lying on a bed or couch, it will be of the greatest benefit, not only to those having to undergo operations, but for the conveyance of all very infirm patients, and will entirely supersede the present system of carrying up and down stairs. 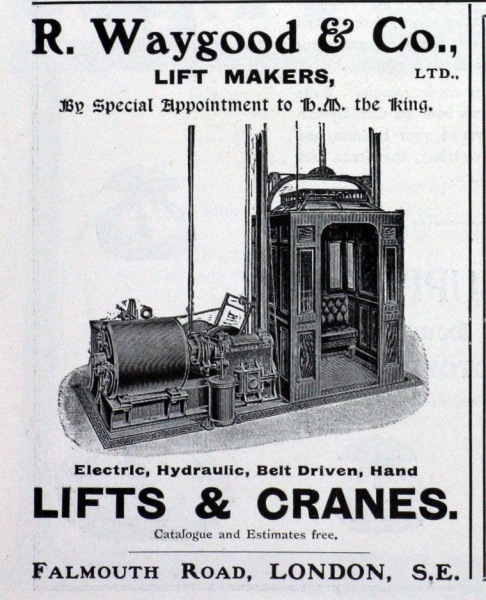 The desire for a lift was finally realised in 1902, with the contract going to R. Waygood & Co. of London. Waygood’s was established in Beaminster, Dorset, in 1833 and moved to London in 1840. In 1900 the company was registered as R. Waygood & Co. It later merged with the Otis Elevator Company and was to install the lifts on the Titanic. The Lift, supplied by Messrs. Waygood, of London, adjoins the anaesthetic room, and is large enough to take a patient lying on a couch. It is a hand-power lift, and can be worked either from above or below or from the case itself, and has already proved extremely useful, avoiding the necessity of carrying patients up and down the stairs on a stretcher. The hand-power lift cost £100. It was to stay in use until the 1920s, when concerns were expressed about its reliability and safety. At the annual governors’ meeting in February 1923 the honorary physician, Dr. William Burroughs Cosens, announced that he was going to start “a begging campaign in order to get a thousand pounds for the provision of a lift”. This would, he said, “save a deal of labour and add greatly to the comfort of the patients who had to be removed from the basement of the building to the top”. Dr. Cosens went on to explain that the creaking of the rope attached to the hand lift had become “very disconcerting”. The first donation to the fund was from a Mrs. R. S. Comben, who said she had been “a victim of the hand lift” . Over £1,000 was raised to replace it with electrically powered equipment in 1925. See www.gracesguide.co.uk for the history of R. Waygood & Co.